Their round but slender outline makes them very easy to handle and only requires low stroke power. They are well suited to medium and high paddling frequency, which is ideal for take-off. The PEAK have an optimized amount of spoon and angle in the blade to achieve a paddle which is super easy to get in and out of the water in any circumstances. Since 2016, some new blade shapes have been introduced in the CARBON HYBRID & FULL CARBON ranges. They feature a V DOUBLE CONCAVE section shape which enhances significantly the lateral stability while the blade is in the water. Benefitting from a better support, the stroke is easier and fatigue is reduced. 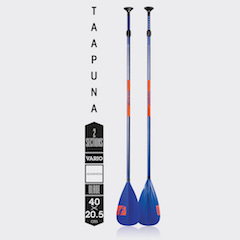 The shaft of the PEAK paddles is designed for the best compromise of flex, hand grip and ease of paddling. Easy to use, the PEAK paddles are available in different constructions. 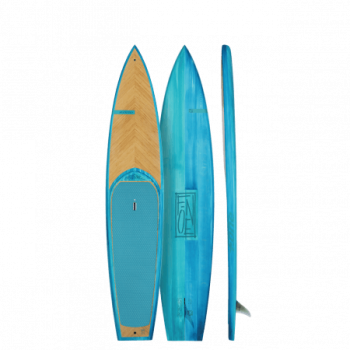 They are therefore well suited to all-around practice but will also satisfy the best surfers with the feather weight achieved using the 100% carbon constructions.